Smoking is bad for your lungs, and it may also have negative effects on your blood pressure, which increases your risk of heart disease. Learn to quit it now! The underlying cause of one out of every five deaths in the US each year is cigarette smoking. You need to understand that smoking can damage every organ in your body, including the heart, lungs, blood vessels, mouth, eyes, bones, reproductive organs, digestive organs, bladder, and more. There is also a direct connection between smoking and blood pressure, which can then lead to cardiovascular problems. Let's find out more about it. Most people know the fact that smoking is bad for the lungs, but it is important to understand that smoking also increases your risk of hypertension and heart disease. Your blood pressure goes up when you smoke; in fact, it can immediately raise systolic blood pressure levels by 4mmHg. You experience this spike in blood pressure because the nicotine in cigarettes stimulates your nervous system to release chemicals that constrict your blood vessels. Here is how smoking can lead to several heart related problems. Tobacco smoke contains several chemicals that can damage your blood cells. At the same time, these chemicals can affect the function of your blood vessels and cause serious damage to the overall structure of your heart. This increases your risk of atherosclerosis, in which you develop plaque in the arteries. This waxy substance hardens over time and blocks the flow of oxygenated blood. This leads to life-threatening consequences. You develop CHD when plaque accumulates in the coronary (heart) arteries. This would result in severe chest pain and increase your risk of heart failure, heart attack, and arrhythmias. When you have other risk factors, such as high blood pressure, high blood cholesterol levels, and obesity, smoking increases your risk of heart disease, which can even lead to death. The arteries that carry blood to the head, limbs, and other bodily organs can get clogged due to a buildup of plaque. This leads to peripheral artery disease, which puts you at an increased risk for heart attack, heart disease, and stroke. You already know the connection between smoking and blood pressure, and you may have already realized how important it is to quit smoking as soon as possible. Here are some benefits of quitting smoking today. Quitting will lower your risk of several diseases, including heart attack, heart disease, emphysema, throat cancer, lung cancer, and gum disease. You will feel healthier and notice an increase in your stamina. You would not have to worry about your sore throat as well. You will notice an improved sense of smell and taste because your nose sensors and tongue bud will recover when you quit. Quitting helps prolong your life and lets you enjoy with your loved ones. 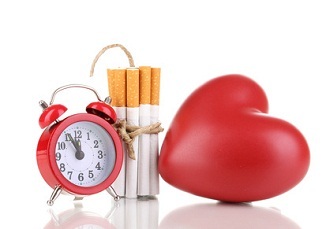 As smoking and blood pressure is strongly related, it is better to quit smoking. However, you will experience some withdrawal symptoms when you quit smoking. It is normal to crave for cigarettes while trying to quit. You may also feel hungry and irritable. Some also find it difficult to concentrate. You notice these withdrawal effects because your body becomes too dependent on nicotine. It is important that you do not become impatient and deal with these symptoms, which usually go away after the first few days. Understand that these symptoms are not the 'side effects' of leaving cigarettes, but they show that your body is trying to heal itself. So, be patient! Select a date to stop smoking and be sure to inform your doctor about it. Create a list of reasons why you want to quit smoking. Be sure to read it daily. Keep a note of what triggers you to smoke. Avoid those triggers to stay in control. Learn about other ways to keep you busy. You can make a list of activities that you can do. Work with your doctor closely and ask them about using nicotine patches and gum in the beginning. Be part of a quit-smoking program to stay motivated. Stop carrying matches, lighter or cigarettes because they will tempt you to smoke for 'one last' time. Try not to be around people who smoke. If you stay with someone who does, ask them to go outside to smoke. You can even discuss benefits of quitting and encourage them to stop as well. Do not take withdrawal symptoms too seriously and focus more on how healthy you will become. Practice breathing exercises when you feel tempted to smoke. A few minutes of deep breathing would help keep you focused. Keep your hands occupied to avoid feeling an urge to smoke. Play with a pencil, scroll through your cell phone, or use your car's dashboard as a drum to keep those hands busy. Do not mingle with people who smoke. It is better to avoid people, places, and situations that would tempt you to smoke. Go for low-calorie foods when you feel like smoking a cigarette. Some good examples are carrot or celery sticks – even sugar-free gums will help. Avoid or limit your intake of caffeinated and alcoholic beverages. They often tempt you to smoke. Exercise regularly because it helps you relax, both mentally and physically. Let others know that you are trying to quit smoking. They will encourage you and motivate you to achieve your goal. Talk to your doctor and learn about different OTC nicotine-replacement products.